This FJ43 was custom-built for a client near Atlanta, Georgia who plans to use his Land Cruiser for quick sprints around town. Here, blacked-out exterior details and crisp white paint create a striking contrast, while the interior impresses with its retro dash and sumptuous leather seating. This is the FJ43, wearing its original steel armor, bolted together and infused with blacked out custom details and modern lighting. It’s a retro-cool design that’s sure to turn heads. 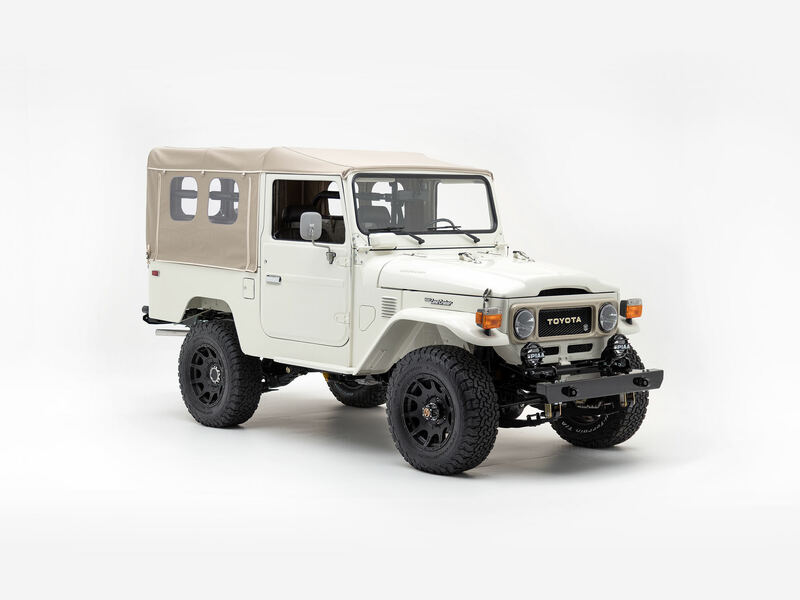 Perfect for casual driving, this FJ43 is equipped with Toyota’s 2F engine backed by a smooth-shifting 5-speed manual gearbox. Upgraded running-gear further refines the ride, giving it new-found confidence on any terrain. The rugged interior of this FJ43 was crafted to captivate. The dash remains faithful to the original design, with its exposed metal and retro controls. Seating and interior door panels are luxuriously tailored in distressed brown leather, while modern conveniences, like a rear backup camera, Bluetooth, and premium sound await your command.